Making compost is one of the most economical ways to fertilize your garden. Compost is an organic fertilizer. 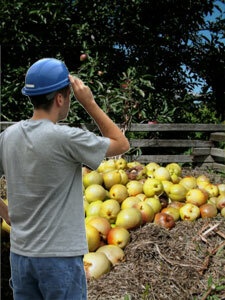 At home, we have a lot of biodegradable wastes that can be recycled and thrown as part of the compost. Composting is a simple process, yet not everyone knows how to make that dark and rich kind of fertilizer which can be considered the best fertilizer for your garden. Ash is a good component of a compost. Yet, just because we have an abundant supply o as h from our fireplace does not mean that you should include all that into the compost. Ash is basic or alkaline. Adding too much ash in the compost increases the overall ph of the compost which may not be good for plants. Just sprinkling a handful of ash is enough. When we see worms in the soil we should not kill it. Their being there indicates that the soil is rich. Worms and other insects are decomposers that happily feed on the biodegradable wastes in the compost and breaking them down into components that are useful as a fertilizer. It has been observed that worms just love coffee grounds that are left behind after brewing coffee, so don’t throw those away into the trash. Instead, sprinkle those on your compost and it will help speed up the process of decomposition. The decomposers in the compost need air to survive. Hence, in order for them to do what they do best they should aerate the compost. Every once in a while, disturb the contents of your compost so that it gets the much needed air to survive as they do what they are doing. Prod the compost with a stick or a shovel to aerate it. Algae and seaweed make great compost. When cleaning your fish tank, scrape off the algae and include it in your compost. Make sure though that it has no traces of salt or chlorine which is not good for the compost. The decomposition process that goes on within the compost is much faster in a hotter temperature. Place your compost bin in a sunny area because decomposer love working under the sun. Adding hay or straw into the compost serves as insulators that can heat up the temperature within the compost bin. Egg shells should be crushed into pieces before throwing them into the compost pit. They are easier to decompose when broken down. Undigested egg shells in the compost do no help at all. Keep your compost moist by adding fluids like your leftover juice instead of just pouring them into the sink. However bear in mind that the fluid added should be just the right amount. No too much that you drown your compost and not too little that your compost gets dry. Composts attract flies and other vermin. Keep it covered with new waste additions that will soon be part of the compost. Make lots of compost by using 2 separate yet big compost bins. While the compost in one bin is still in the works of decomposing under the, you can start collecting new wastes in the other. When you have used up the contents of the first bin, you have another ready. Then you can start filling the empty bin with new waste. It’s a continuing cycle.